The brugmansia has grown up quite tall, struggling to reach the light amid the surrounding trees. 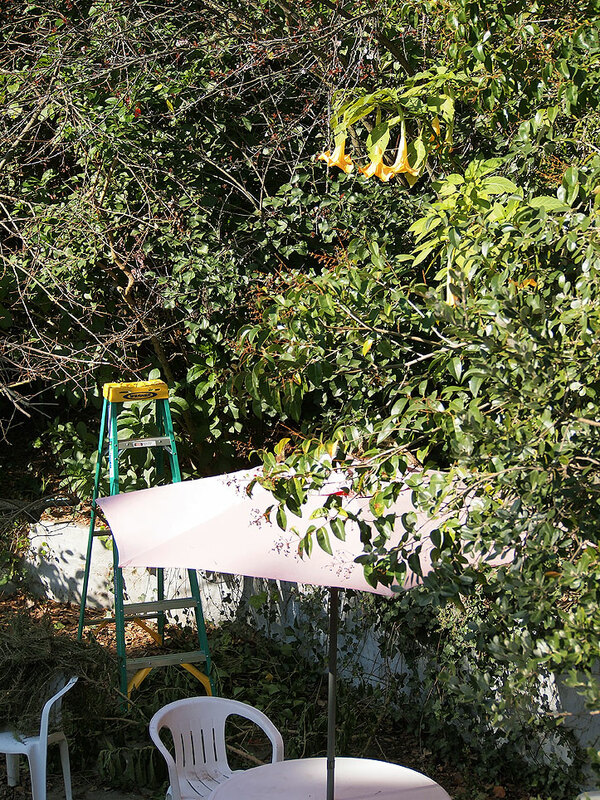 The ladder, placed there for pruning, gives a sense of scale. The large yellow flowers (called Angel’s Trumpets) are fragrant in the evening. This variety is called Charles Grimaldi, named, I think, for the grower, though the name always reminds me of the famous Victorian clown Joseph Grimaldi (he’s the reason circus clowns were called “Joeys”). This is said to be one of the best varieties of brugmansia around. My plant suffered setbacks from a few of our rare frosts when it was young, but it survived and has recovered nicely. This year I’ve started feeding it with tomato fertilizer, hoping to promote more foliage and flowering. We’ll see how that goes. All parts of the brugmansia are poisonous. It’s related to datura — both are in the family Solanaceae — but is not exactly the same plant. Most daturas require more sun and less water than brugmansia, though there is a lot of variation among them. In the western U.S., some are known as “jimson weed.” Brugmansias tend to be woodier and taller — they are sometimes called “tree daturas.” You can read more about the difference here.